A brand new year is here and the time when all of the internets declare their resolutions for the new year is upon us. I love that I get to see so many of my friends post their goals for this year, they are so determined. Eat a plate a food without having to share a single bite. Shower daily without feeling like I am part of a peep show. Realistic, right? Tell that to my 2 toddlers. So, this got me thinking and I said self, it is about time I set some new years “goals”, “challenges”, “resolutions” , whatever you want to call them. 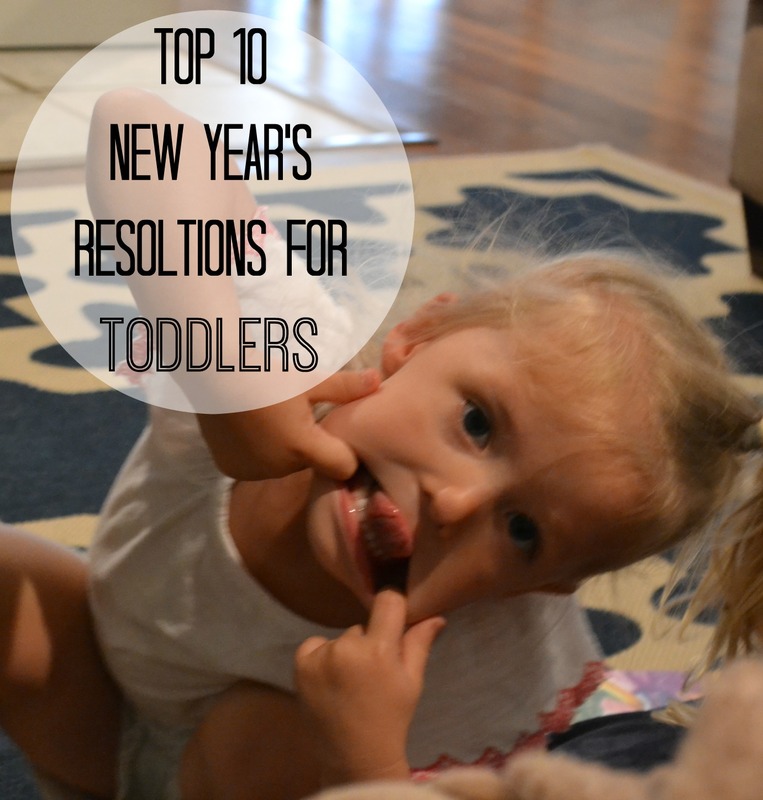 But these are not for me, these are the Top 10 New Year’s Resolutions for TODDLERS! 1. I will refrain from suddenly “needing” my mom as soon as she picks up her phone to have a quick conversation. Dropping my cup and it being out of arms reach to pick it up. Not being able to have cookies at 8am. And being fed a purple grape instead of the green one I told myself I would have. 3. I will allow my mother to pee alone at least once a day month. 4. I will try to eat more than chicken nuggets, pizza and grapes and understand that there are other delightful foods that I can partake of. 5. I will not dump out and mix together all of the small pieces to every toy I own. I understand that if I do so this may or may not result in my mom loosing it one day and dumping said toys in the dumpster. 6. I will allow my mom to wipe all foreign matter off of my face with a wipe instead of wearing it proudly around town as if it is a battle scar. 7. I will limit myself to asking a question 1 time, maybe 2 instead of repeating it over and over and over and over and over again to my mom. 8. I will stand, sit, kneel or lay still on a piece of furniture that is not the kitchen table for at least 1 minute everyday without my mom having to ask me to. 9. I will refrain from licking dogs and just allow them to lick me. 10. I will continue to be ridiculously cute which is what has allowed me to get away with all of the above nonsense thus far! So far our New Year is off to a great start and all resolutions have been kept except for number 9! I call that a success! Hahahaha oh dear. Let’s hope Kennedy reads this post!